Background: A review of literature indicates the Arab cephalometric pattern compared to the Caucasian cephalometric pattern is skeletally bimaxillary retrusive, dentally bimaxillary protrusive, and more divergent palatal and mandibular planes. Objective: The aim of this study was to clarify the cephalometric features of Emirates adults with Class I malocclusion and pleasing soft tissue profile and to evaluate for gender differences. The null hypothesis tested was no differences in lateral cephalometric measurements as a function of gender. Materials and Methods: The lateral cephalometric radiographs of adult Emirati nationals with Class I malocclusion were analyzed in order to characterize an indigenous Class I malocclusion population in the United Arab Emirates. Lateral cephalometric radiographs of 30 males with average age of 24.52±6.09 years and 31 females averaging 23.57±5.52 years were analyzed using Dolphin Imaging software. Twenty-two hard and soft tissue measurements comprised the cephalometric analysis. Results: Only one gender difference was demonstrated out of the 22 cephalometric analysis measurements used in the study; SN-PP mean for females (10.74±3.44 degrees) subjects averaged a 2.3 degree higher mean value than the males (8.43±3.95 degrees, P=0.018). The cephalometric study results were compared to published norms from Steiner and Eastman. Conclusions: Based upon the conditions of the present study, it may be concluded that adult Emirati males and females seeking orthodontic treatment with Class I malocclusion present similar cephalometric profiles with the exception that measurement SN-PP may be steeper in females than males. Moreover, Emiratis are likely to present greater incisor proclination and protrusion than Caucasians and may be generally considered as more bimaxillary protrusive. Orthodontics craniofacial "norms" vary and must be considered based upon the intended use or application. Esthetic profile "norms" are dictated by temporal values as there is greater preference today for a protrusive lip posture compared to yester-year; facial soft tissue "norms" depend upon imaging technique as 3-D contour assessment enables a vastly different data set than 2-D profile analysis. When the focus is on comparing the morphological characteristics of different ethnic populations, however, 2-dimensional lateral cephalometric analysis is likely the best resource. 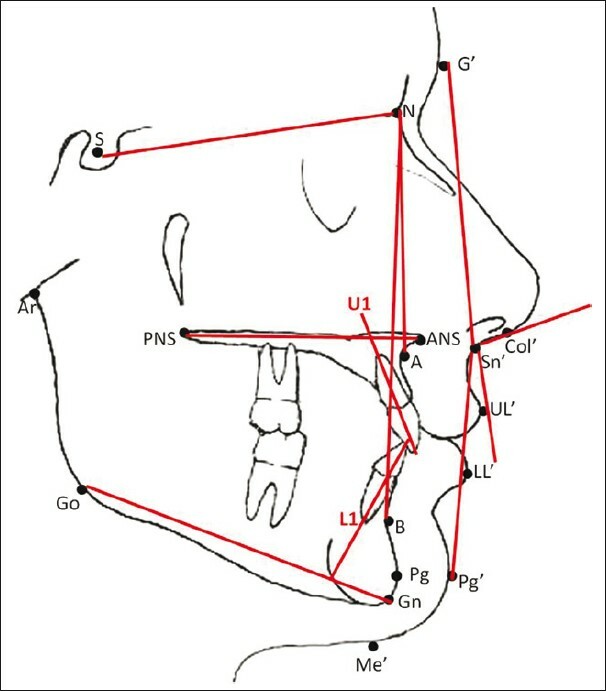 Two-dimensional lateral cephalometric analysis persists as the orthodontic standard for identifying the problem sources in skeletal and/or dental malocclusion relationships. Because cephalometric analysis developed as a technology largely in the West, Euro-American Caucasian normative databases are typically used a reference to characterize craniofacial morphology in patients. Two well known and commonly used Caucasian normal databases for comparison are from the Steiner  and Eastman (MacAllister  ) samples based upon Class I normal faces and occlusions. Many studies related to cephalometric and profile norms have been published for subjects from America, Europe, and Japan, India, Iran, and China. There have also been eight cephalometric normative studies focused on Class I appearing subjects from the Middle East region including Saudi Arabia, Kuwait, Egypt, Syria and Jordan. To date, there have been no cephalometric normative studies conducted on subjects from the United Arab Emirates. The eight cephalometric Middle East studies of individuals with Class I and/or Class I appearance provide insight into morphological differences between Arab and Caucasian populations. In Saudi samples, Sarhan  , Hassan  , and Al-Jasser ,, found greater proclination and protrusion of incisors compared to a Caucasian sample. In addition, Sarhan described a slightly more prognathic faces in Saudi boys while Hassan found Saudis more bimaxillary skeletal retrusion than Caucasians but Saudi males were more prognathic with steeper mandibular plane angle than Saudi females. Al-Jasser  reported higher mandibular plane angle in adult Saudis with Class I occlusion and esthetically pleasing and harmonious faces. Relative to Caucasians, more proclination and protrusion of incisors was reported in Kuwaitis  and in subjects from Jordan (Handan 2001). Bishara  described Egyptian boys as having a tendency toward bimaxillary dental protrusion compared with Iowa boys; Egyptian girls had a relatively more convex profile and a tendency toward mandibular dental protrusion. In summary, the only consensus in literature comparing the Arab and Caucasian cephalometric patterns is that Arab subjects demonstrate greater bimaxillary dental protrusion. The aim of this study was to clarify the cephalometric features of Emirati adults with Class I malocclusion and pleasing soft tissue profile and to evaluate for gender differences. The null hypothesis tested was no differences in lateral cephalometric measurements as a function of gender. UAE native (national) only (as evidenced by family name). Patient files located at Abu Dhabi Dental Center were randomly inspected for the presence of lateral cephalometric radiographs and tentatively included in the sample based upon diagnostic quality and the sample selection criteria. All lateral cephalograms initially included in the sample by the primary investigator Tayseer Al Zain (TAZ) were reviewed by the research supervisor Donald J. Ferguson and verified for inclusion in the final sample; differences of opinion on sample selection were discussed and consensus opinion reached including the presence of pleasing/harmonious/balanced profile. The final 61 lateral cephalograms were then scanned into digital format using a 300 DPI scan setting. Dolphin imaging system software package version 9 was used to perform the digital cephalometric analysis comprised of 12 angular [Figure 1] and 9 linear [Figure 2] measurements, and one ratio measurement. All cephalometric analyses were performed by one individual TAZ; reliability testing was performed on five lateral head films in order randomly selected. Analysis was repeated one and two weeks later on the same five cephalograms and the results of the three testing phases were statistically compared using the Dahlberg reliability formula. Intra-operator error ranged from 0.0 to 0.73 degrees for angular measurements and 0.0 to 0.43 millimeters for linear measurements, no differences were determined (P>0.05) and intra-operator reliability was deemed satisfactory. Data was entered on an MS Excel spreadsheet then converted to Statistical Package for the Social Sciences (SPSS) version 15.0 for PC software format for data processing. The Student's t-test was used to determine significant differences between male and female measurement means. Significant differences were determined at the 95% probability level. A difference of 2 degree or 2 millimeters was considered clinically significant. The lateral cephalometric radiographs of Emirati nationals with Class I malocclusion were analyzed in order to establish a normative database representing the United Arab Emirates. Lateral cephalometric radiographs of 30 males with average age of 24.52±6.09 years and 31 females averaging 23.57±5.52 years were analyzed. Twenty-two hard and soft tissue measurements comprised the cephalometric analysis. Only one measurement was determined to be statistically different between genders. The measurement SN-PP was significantly larger in the female group (10.74±3.44 degrees) compared to males (8.43±3.95 degrees, P=0.018) [Table 1]. 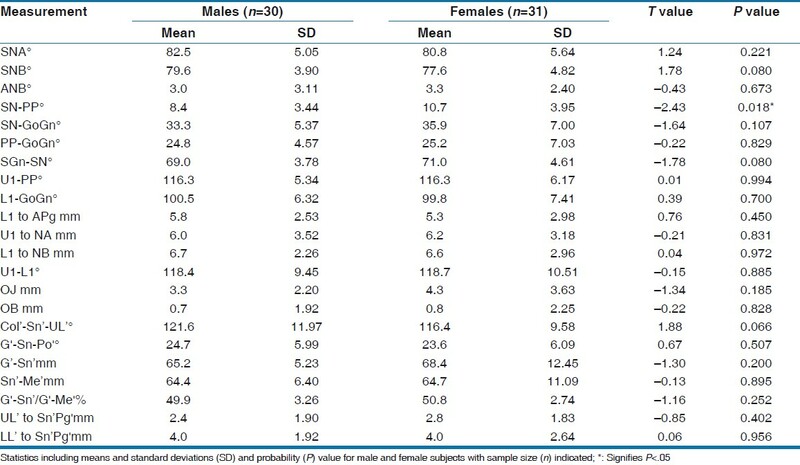 The results revealed no gender differences between adult Emirati males and females in skeletal or dental relationship except for measurement SN-PP; females (10.7) subjects averaged a 2.3 degrees higher SN-PP measurement compared to males (8.4) subjects. The cephalometric values from the Emirati study were compared to published Steiner  and Eastman (MacAllister  ) normative cephalometric values [Table 2]. The comparison demonstrated similarity in antero-posterior cepahalometric angular measurements with both normative values; no apparent differences were found in angles SNA, SNB, or ANB. In contrast, measurements of the position of the dentition were dissimilar. Interincisal angle in the Emirati sample averaged 118.6 and was substantially less than the Steiner (127.0) and Eastman 134.0) values. The Emirati sample also had more proclined upper (116.3) incisor position compared to the Eastman value (108.0), and Emirati lower (100.1) incisors was substantially more proclined compared to both the Eastman (91.0) and the Steiner (93.0) values. The dentition was substantially more protrusive I the Emirati sample with U1-NA and L1-NB values more than 2 millimeters more anterior than the Steiner norms; Li-APog value for Emiratis was about 6 millimeters more protrusive that the Eastman value. 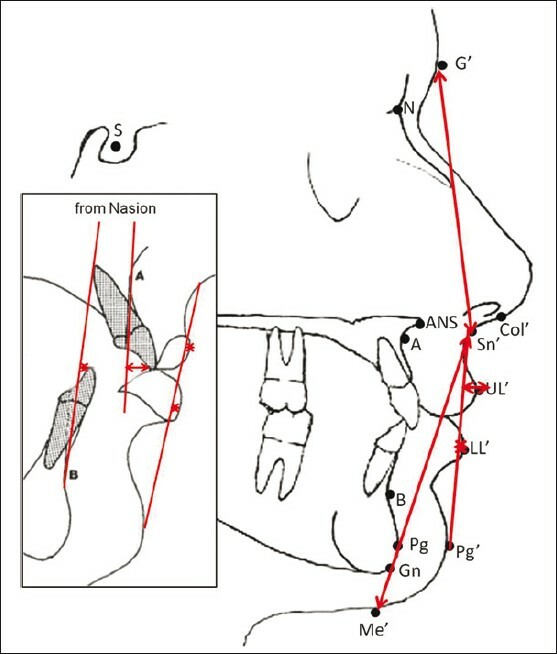 In 2001, Hamdan  cephalometrically compared 65 Jordanian subjects with Class I incisors appearance aged 14 to 17 years to an Eastman sample and found that the Jordanian adolescents had lower mandibular plane angle, greater proclination of upper and lower incisors to their respective alveolar jaw bases, and lower incisors were 4 to 6 millimeters more protruded relative to A-Pog. Hence Jordanians were more bi-maxillary protrusive. The subjects used in the present study were from the patient files of individuals presenting for orthodontic treatment. It must be acknowledged that, although all had pleasing profiles as evidenced from examining the lateral cephalogram, dental protrusion may have been a reason for seeking orthodontic treatment. Perhaps the routine cephalometric radiographs of patients with Class I appearance and occlusion seeking treatment for impacted canine could have been a better sample source. A sample of 61 adult Emirati nationals were analyzed in order to clarify the cephalometric features of Emirates adults with Class I malocclusion and pleasing profile and to evaluate for gender differences. The sample was comprised of 30 males and 30 females with a mean age of about 24 years who had presented for orthodontic treatment at one of the two Abu Dhabi national dental centers. Ethnicity was validated based upon family name. Dolphin Imaging software was used to perform the cephalometric analyses. Only one gender difference was demonstrated out of the 22 cephalometric analysis measurements used in the study; SN-PP mean for females (10.7) subjects averaged a 2.3 degree higher mean value than the males (8.4). The cephalometric study results were compared to published norms from Steiner and Eastman. Based upon the conditions of the present study, it may be concluded that adult Emirati males and females seeking orthodontic treatment with Class I malocclusion present similar cephalometric profiles with the exception that measurement SN-PP may be steeper in females than males. Moreover, Emiratis are likely to present greater incisor proclination and protrusion than Caucasians and may be generally considered as more bimaxillary protrusive. 1. Steiner CC. Cephalometrics for you and me. AJO 1953;39:729-55. 2. MacAllister MJ, Rock WP. The eastman standard incisor angulations: Are they still appropriate? Br J Orthod 1992;19:55-8. 3. Sarhan OA, Nashashibi IA. A comparative study between two randomly selected samples from which to derive standards for craniofacial measurements. J Oral Rehabil 1988;15:251-5. 4. Hassan AH. Cephalometric norms for the Saudi children living in the western region of Saudi Arabia: A research report. Head Face Med 2005;24:1-5. 5. Al-Jasser NM. Cephalometric evaluation of craniofacial variations in normal Saudi population according to steiner analysis. Saudi Med J 2000;21:746-50. 6. Al-Jasser NM. Facial esthetics in a selected Saudi population. Saudi Med J 2003;24:1000-5. 7. Al-Jasser NM. Cephalometric evaluation for Saudi population using the downs and steiner analysis. J Contemp Dent Pract 2005;6:52-63. 8. Behbehani F, Hicks EP, Beeman C, Kluemper GT, Rayens MK. Racial variations in cephalometric analysis between Whites and Kuwaitis. Angle Orthod 2006;76:406-11. 9. Bishara SE, Abdalla EM, Hoppens BJ. Cephalometric comparisons of dentofacial parameters between Egyptian and North American adolescents. Am J Orthod Dentofacial Orthop 1990;97:413-21. 10. Hamdan AM, Rock WP. Cephalometric norms in an Arabic population. J Orthod 2001;28:297-300.